plankton – Real Science at SOEST! HAS MOVED! Here is our second entry of our 1st SOESTblog Writing Contest “What drives you?”! Each week, contestants will share what drives them to do their research day in and day out. Each article will be posted for 1 week and winners will be determined by the most # of reads on the site! Help Michelle this week by sharing her article! What is it that scientists really do? And what drives them to do it? The life of a scientist is not as straightforward as you might think. To the left is a list of 18 things I am expected to do as a graduate student scientist— in addition to the necessary daily human activities such as grocery shopping, maintaining personal relationships, and keeping my apartment clean. Given that outrageous list, I sometimes feel that there aren’t enough hours in the day So what keeps me going? I love being out on the waves, feeling the sets roll in, seeing the blue-green of the water. What makes it even better is to know what caused those waves and what shapes them, how the smell and color of the sea is related to recent rainfall in the area, that the little moving specks in the water are actually living, breathing plankton that fuel healthy ocean ecosystems. I would not be happy working in the office all day, every day, crunching numbers or making phone calls. I would not be fulfilled as a veterinarian, neutering animals half of the week and seeing sick animals the other half of the week. I would not be satisfied working with laboratory animals, born to a life in a cage living far from their natural habitats. I know these things because I have experience with them and decided that I wanted more. It is only through experience that you can truly decide if a career path is right for you, and I am thankful, and have deep respect for everyone who has been a part of these prior experiences. The moment I decided to move to Hawaii with my scientist husband, Sean Jungbluth was life-changing. That is when I discovered my love for oceanography (and copepods!). Some of what drives me is the diversity in that long list of responsibilities I just gave. The inherent challenges in that list keep me feeling fulfilled, most of the time. Be the basis for future discoveries! I could, if I’m very lucky and work hard enough, make a discovery that illuminates or changes our relationship to the world around us! When I feel discouraged, or when an experiment does not go as planned, these are the things that inspire me to push onward. 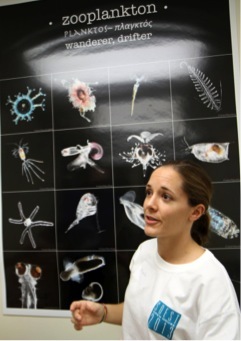 Me at the 2013 SOEST Open House, where I helped create an exhibit teaching schoolchildren and families about zooplankton, hoping to inspire future generations! I am thankful for the hundreds of people who have been my teachers or mentors throughout my life so far. From my parents and grandparents, to all my teachers in the 20+ years of K-12, college, and graduate education, my employers over the years, and the past and present scientists who inspire me. It is due to your inspiration that I am driven to be who I am, and do what I do every day. Liked Michelle’s article? Share her post today! 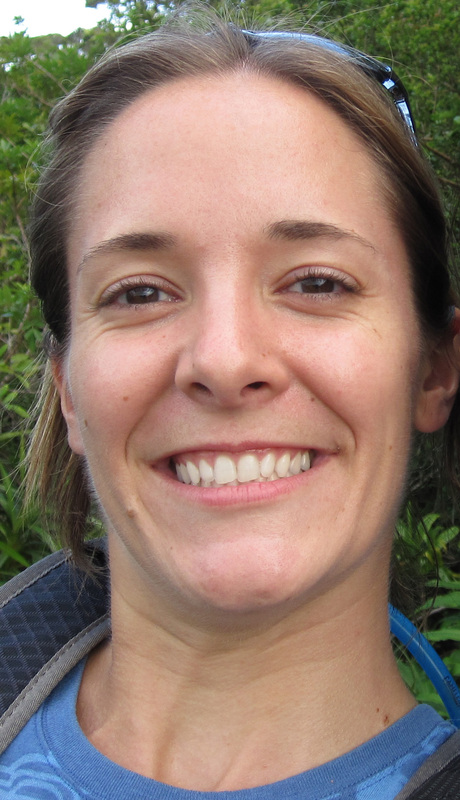 Michelle Jungbluth is a PhD candidate in the Department of Oceanography at the University of Hawaii at Manoa. 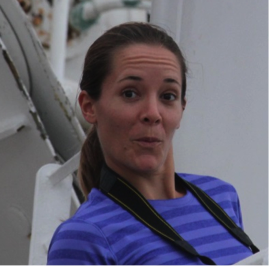 She uses traditional and novel molecular techniques to study plankton food web interactions and the importance of highly abundant larval copepods in marine ecosystems. She is also a co-founder of the Science Communicators ‘Ohana and a Teaching Assistant for Introductory Oceanography OCN 201 at UH Manoa. October 23, 2011. The day started out sunny, warm, pretty much a normal day on Oahu. Little did I know that it was going to be my own personal ‘D-day’, the next day would be the beginning of a very busy 14 days. I was having a great night grilling at a friend’s house in St. Louis Heights. After taking a step out of the house to get some fresh air, I looked mauka into the sky, and noticed the clouds looked darker than usual over the windward side. “It’s going to happen tonight…” I said, more to myself than anyone around me. Sure enough, a couple of hours later I went home, hopped on the internet and checked the rainfall. 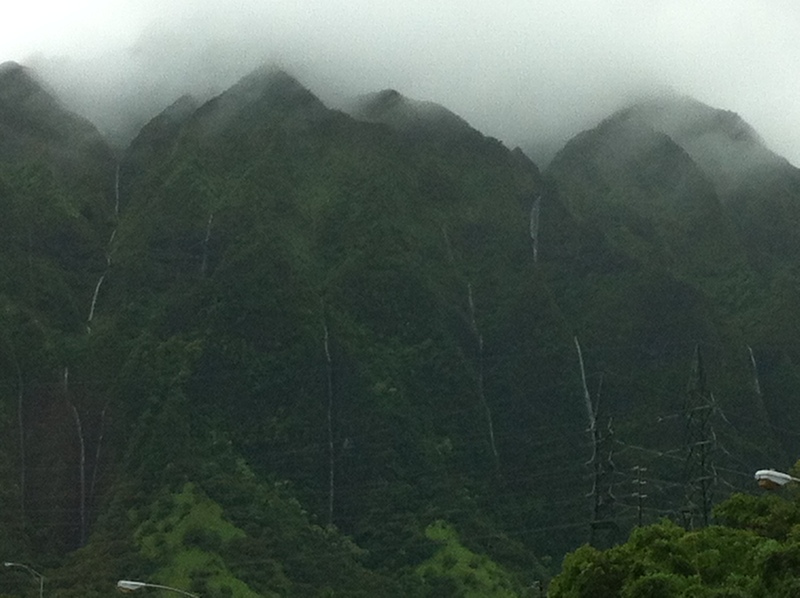 They had already received over an inch of rain in Kaneohe, with no sign of letting up. I had been preparing for months: e-mailing undergraduate clubs looking for any bodies willing to be ‘on call’ for helping with sampling, assembling all the supplies I would need, checking the forecasts, and generally keeping my wits about me waiting for the day to come. Greater than 2 inches of rain in 24 hours, that was my trigger. No less. I started my “rain watch” in late August, after that any hint or mention of rainfall made my ears perk up, and I immediately checked the forecast. But one of the first things I learned is that it actually can be difficult to predict severe weather on the islands more than a few days out, unless it’s a monster of a storm. You might be wondering why I am chasing a storm. Well, I am interested in the response of the plankton community to storm events and how these storms influence the marine food web around the Hawaiian Islands. We know that the influx of nutrients causes rapid changes in the plankton communities within short time scales, and I specifically want to know what is happening to different species of copepod nauplii (youngest life stages of copepods, the most abundant metazoan in marine ecosystems all over the world) after these storms, as compared to calm non-storm periods. This requires sophisticated DNA-based methods, which will be the topic of a future blog article and (hopefully) a few journal articles. Sunny vs Showers. Contrasting conditions in the bay lead to very interesting plankton dynamics, there are mountains behind that grey haze of clouds. Once I arrived home on the night of the storm chase, I sent a flurry of e-mails: to my list of available volunteers to start assigning days to people and get the first couple of days covered, to reserve a boat for all 14 days at HIMB, and finally, the e-mail to my advisors, subject line: “Storm chase-now!” with obvious contents. The 14 days of sampling was a whirlwind of activity. I drove all my supplies from UH Manoa across the Koolau Mountains to HIMB, took the shuttle boat across to Coconut Island, loaded my supplies onto the boat, drove it to my GPS-located sampling location in the center of the South Bay, collected all my samples, measured the water quality, left my supplies on HIMB (I am ever so grateful to someone who will remain anonymous, thank you for sharing your space), and drove my samples back to campus for processing, which was another hour of work. Then rinse and repeat the same procedure for 13 more days. 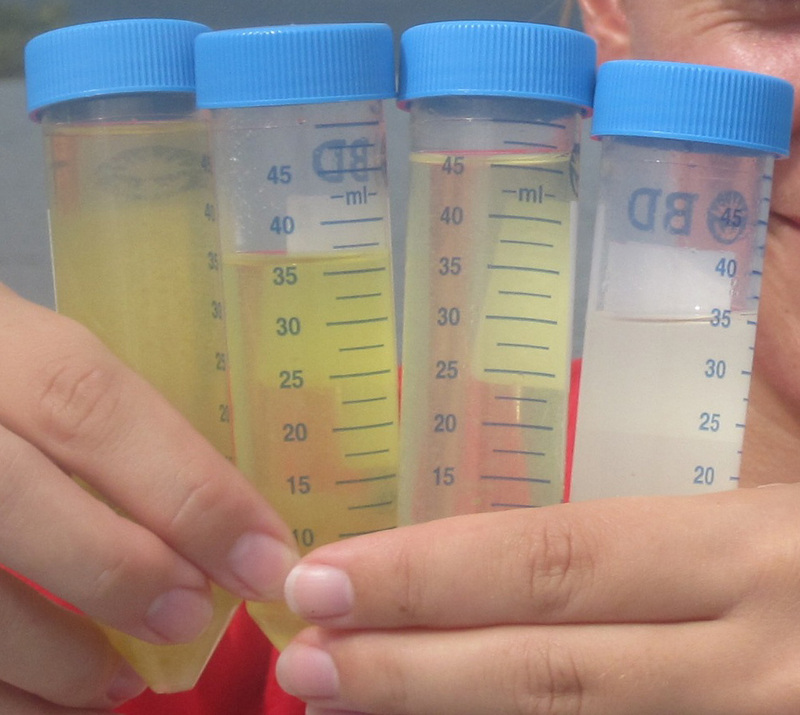 The dynamics of the bay tend to change rapidly, and we could see that in the clarity of my plankton samples as well as the water quality measurements. One day the chlorophyll levels were low and stratified, the next day they were high and seemingly well-mixed. “Oh look, the freshwater lens is coming, I better collect my zooplankton before it gets here!” to avoid clogging my fine-mesh plankton net. Each day was an adventure. Each day also presented unique challenges. One day an unmanned sailboat slowly drifted past my boat while I was anchored, and we called it in so that someone could tow it back to its origin before it drifted into the unsuspecting reef. Another day we rescued a fellow boater whose engine failed and left them stranded not far from HIMB. On a breezy Sunday, we were anchored at the field site, and then out of nowhere a sailing race began in the exact region of the bay we were sampling from! I don’t think the sailors were thrilled about it but hey, there was little I could do, I had been sampling there for the past 2 years doing my time-series. And then there were the days we got stuck in the pouring rain… I rushed to collect my samples while my wonderful volunteer intermittently bailed the boat to keep us from sinking. However, most days were average, gorgeous Hawaiian days, and sampling could not have gone more smoothly. Those days always remind me how lucky I am to study biological oceanography at the University of Hawaii at Manoa. I am finally processing those samples for my PhD work and getting some really exciting data, which is a nice addition to having stories about storm chasing. 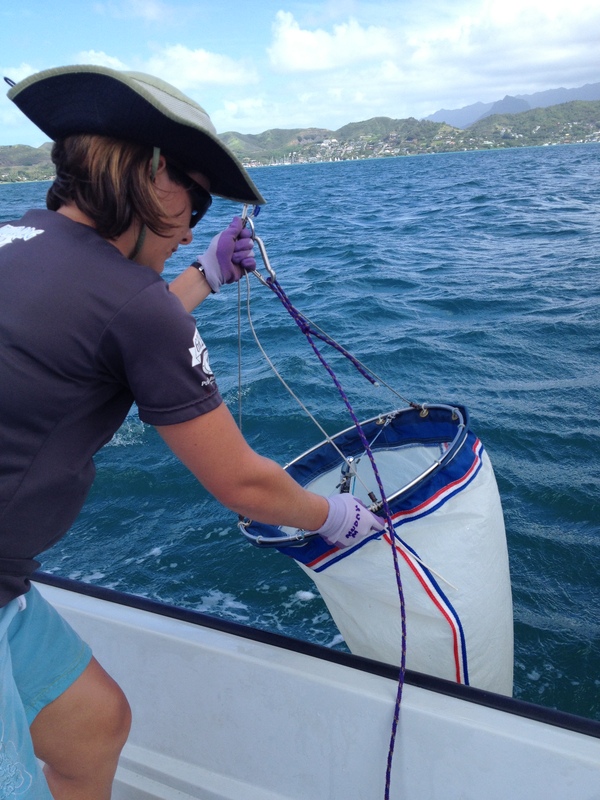 Michelle Jungbluth is a student in the Biological Oceanography department at UH Manoa characterizing the response of plankton communities to storm events in Kaneohe Bay. She is specifically looking at the response by copepod nauplii, the youngest (and more abundant) life stages of copepods, using a DNA-based method called quantitative real-time PCR to study their role in the marine food web.